Coyote Blog » Blog Archive » Mis-Reading the Recession? « So, Tax Rebates are OK? As businesses deleverage, which they are doing, they won't be able to offer as much credit to consumers. The business credit crunch may not have flowed through to consumers yet. People still employed using credit to pay bills. ps...and large purchases of ammo and MRE's. Too lazy to check this, but I speculate that a large proportion of functional consumer debt -- home equity loans -- has in fact dried up. I further speculate that consumption driven by home equity loans has declined by a lot more than credit card debt has gone up. 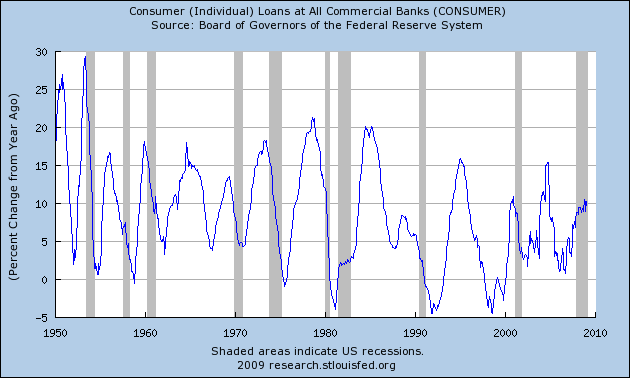 The bigger problem, though, is that consumer consumption is a lagging indicator in this recession. First, lending to business went away (after Labor Day). Then, businesses started laying people off or deferring hiring, because they were worried about their loan covenants (knowing that covenant waivers have gone from easy to well-nigh impossible, or at least very expensive). Finally, the soaring unemployment (and rising savings in anticipation of unemployment) will trash consumer spending. And I agree with TXJim when he said that people are trying to bridge their own tough times with revolving debt. That will show up in soaring default rates in a few months. The graph probably represents loans held by banks. Before the current crisis banks lent money and moved the loans off their books by securitizing them. Now with no one willing to buy these securities these loans are accumulating on their books. Or the fact that the credit crisis really got going last october but the current recession began at the end of 2007 when the economy was still growing and so was consumer credit. Take a look at this graph after a few more months. It doesn't really matter. If the data doesn't show a credit crunch what else could cause GDP to contract by 4 percent last quarter (which will probably be revised to 5 percent)? A meteor strike? An alien invasion? Those are all plausible but it wouldn't explain comparisons to other recessions, most of which show a drop leading to and during the recession itself. 2. Interbank lending has dried up. 3. Commercial paper (CP) issuance by nonfinancial corporations has declined sharply and rates have risen sharply to unpredictable levels. They use Fed and Bloomberg data to argue that all four claims are false. And they have a raft of charts such as the one you showed that counter the impression of a systematic credit crunch. in which the author doesn't find as much credit rationing as we might expect, though certain individuals and firms are undoubtedly having trouble. Last fall risk-aversion among investors suddenly rose post-Lehman. This occurred on the back of large losses through 2007 and 2008, which generally prods investors eventually to retrench. It happened also because certain institutions and channels that help the economy spread risk to parties that are willing to accept it apparently failed. So we suddenly saw the CP market for financial corporations dry up even as non-financial corporations in general experienced little more than a hiccup in their portion of the CP market. Bottom line... it's complicated and still unclear. This ongoing ambiguity is why it's still worth investigating as a policy matter how to fix failed intermediary markets for risky debt even if its not apparent that a systemic credit crunch really exists. Nobel laureate Robert Lucas at Chicago noted in a seminar last month that we're seeing not so much a "flight to currency" as in the early '30s but a flight to currency-like instruments and promises (including US Treasury debt.) He pointed out that the Fed has pumped hundreds of billions of dollars of reserves into the economy. It's unclear how much of this will have price effects (countering deflation now; causing inflation later) and how much will have production effects, stimulating goods and services markets. The existing macroeconomic and monetary models don't enable us to understand these phenomena clearly. Sorry to run on about this. It's difficult to condense into a couple paragraphs. Thanks again for the piece. There's an article in today's Washington Post previewing Obama's first budget, some details of which are supposed to come out this week. I thought this worth raising. Axelrod is a mouthpiece for it. They say they plan to cut deficits with reduced war spending and increased taxes on the wealthy. It confirms where Obama-Axelrod are headed. Axelrod has a key tell: "Most Americans will come out very well here." Obama-Axelrod expect that most Americans will support a plan if they don't think they're the ones paying for it. What's missing from the equation is jobs and growth: Obama-Axelrod are taking us down a path that will likely lead to stagnation, with little or no economic growth. There's a world of difference between a US GDP growing at 3-4%, and one where we're not. When we grow at 3-4% ... our long-term historic average ... we double in just over 20 years, so that every generation can be better off. If instead, we have a "lost decade" it will be very hard for our government to support its commitments. I also expect that the numbers in the plan won't add up. In a world where the new measuring stick is a trillion dollars, the expected cost savings will look small ... they'll look small even when compared to the increased spending commitments in the stimulus bill. It'll be hard to narrow the deficit by just eliminating the Bush tax cuts for those who make over $250,000 ... which would take us to a top rate of 39.6%. As sources of spending cuts, Obama-Axelrod are touting reduced Iraq war expense as the biggest source of saving, but that can't be more than $100B per year, and more likely less ... chump change in this context. ~ Define "rich" at a lower level. Say $150,000 or even lower. ~ Eliminate caps on payroll taxes. In effect this would raise the top marginal rate to 50% or more. Many state and local governments are also looking to raise their highest tax rates. ~ Increase other taxes like the estate tax, and promise aggressive collections. But it's not a revenue problem. The federal government has consistently gotten 19% of GDP in taxes, no matter what tax system it has in place ... but spending has jumped to 26% ... which is why we have deficits of over $1 trillion. We can't ever hope to get the budget in line without getting serious about cutting spending. I've feared exactly this: that Obama-Axelrod have a Machiavellian plan to use enormous deficits and our tax system to level society in a bloodless revolution ... but it won't make us a worker's paradise ... it'll just turn us into a big Argentina. The author doesn't find as much credit rationing as we might expect, though certain individuals and firms are undoubtedly having trouble. Last fall risk-aversion among investors appeared to rise suddenly post-Lehman. This occurred on the back of large losses through 2007 and 2008, which generally prods investors eventually to retrench. Yet it's possible that investors may well not have suddenly become highly risk-averse. Instead, they may have been willing to hold certain risks; however, they had previously been holding these risks via intermediaries that suddenly ceased to function or channels that constricted. These intermediaries and channels help the economy spread risk to parties that are willing to accept it. The result was that banks could no longer finance their short-term liabilities in the CP market, let alone the esoteric derivatives markets they had relied upon. Soâ€¦ thereâ€™s a credit crunch among a certain clientele of borrowers, but not consumers in general. Maybe investors as a group got more risk averse; maybe they didnâ€™t but in any event the methods of allocating risk failed. Bottom line... it's complicated and still unclear. Nobel laureate Robert Lucas at the Univ of Chicago (whose work once and for all discredited Keynesian stimulus theory) noted recently that the existing macroeconomic and monetary models don't enable us to understand these phenomena clearly. Macro as a whole hasn't progressed a great deal since John Hicks' IS-LM model in the 1930s.